In Payday: Crime War, players will compete in four-on-four multiplayer matches as either the "heisters" (criminals) or the cops. At E3 2016, Starbreeze unveiled Payday: Crime War, a mobile multiplayer first-person shooter in the popular Payday franchise. While the Payday console and PC games allow users to team up with friends to complete heists at a variety of locations, Payday: Crime War will allow players to compete in four-on-four multiplayer matches as either the “heisters” (criminals) or the cops. As gamers play, they’ll be able to unlock upgrades and more powerful gear for their characters. Matches will take place in locations such as the Bank and the Golden Grin Casino. 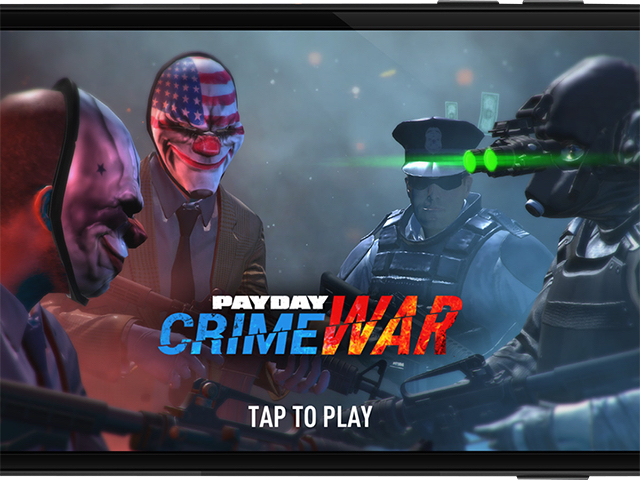 Payday: Crime War is coming soon to iOS and Android. E3 attendees can try a first preview of the game in the Payday 2 booth.